I’ll admit that Google’s Project Glass is totally ridiculous, but it’s also the most exciting thing the company demoed today at Google I/O. At the conference, the company disclosed a bit more about what we can expect from the “glasses,” far away though they may be from launching. The device includes memory, a processor, a touchpad on the side, a button for taking pictures, microphones, camera, speaker and sensors like an accelerometer, compass and gyroscope. An “Explorer” edition was made available for preorder by U.S. I/O attendees today for $1,500, and from what we could see something like a thousand people signed up. The developer version will come out early next year, and the consumer version will be out less than a year later, according to Google X leader Sergey Brin. The consumer edition will be sold for a “significantly lower cost” than $1,500, but it won’t necessarily be cheap. Brin doesn’t anticipate including any advertising in the interface. There’s no 3G radio in the glasses, so when users are outside they have to tether through their phones. Battery life is a significant issue. 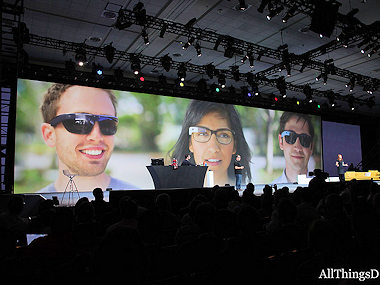 Right now Glass prototypes last about six hours, but Google wants it to be a full day. Photos are stored locally, but users can opt to automatically share them to the cloud, like Instant Upload in Google+. Besides the exterior button or tethering to their phone, users can tell the device what to do with their voice. In testing, this has been the most effective input, Brin said. Yes, Google is aware that it needs to develop the product to work with prescription glasses. As for what you can do while wearing Glass, some of the big activities are getting notifications and texts, and taking pictures. The team has also played around with voice-to-visual search, and time-lapse photography. “So far what we’ve been trying to do is really cover your bases for things you want to do often that are not a very involved interaction,” Brin said. Brin doesn’t think Web browsing is a likely activity for the device. He also said he didn’t think facial recognition was particularly compelling. “Not to say we’ll never support it but we’ve not been quite as excited about it as science fiction might be,” Brin said.